When you buy car insurance, your teenager with the brand new license is insured under your policy when they drive your car. But when you buy life insurance, your child isn’t automatically also insured under your term life insurance policy. However, adding children to your policy isn’t difficult or expensive. Let’s break down the process of adding a life insurance child rider and the term life insurance cost to do so. When you think of life insurance, you probably think that benefits only occur if someone dies. The death benefit is only one aspect of life insurance. When it comes to life insurance for children, there are a few other benefits as well. Having time and resources to grieve should your child die unexpectedly. Guaranteeing your child’s future insurability. The easiest and most affordable way to buy life insurance on your children is by adding a child rider to your term life insurance policy when you purchase one. A life insurance child rider is an “add on” you can purchase with an individual life insurance policy that not only covers the life of your children, but it can be converted into a permanent policy later on in life without your child being required to show evidence of insurability. When you’re applying for life insurance, most policies offer a child rider purchase option. If you want to add a child rider onto your policy, all you typically need to do is approve of the premium increase and fill out a short questionnaire about your children’s health. Not all life insurance child riders require health questionnaires. We will touch on this later in this post. Should the worst occur and your child dies at a young age, a child rider will provide you with a lump sum death benefit. Most commonly, this money is used for a funeral and memorial service. Because the insurance company is able to provide a check quickly, it allows you to take time off work to grieve without having to worry about expenses. Life insurance child riders can be as low as $50 per year, less than $5 per month, for a rider with $10,000 in coverage. Not all insurance companies offer child riders, but many of them do. Below is a table that shows the companies we work with and whether or not they offer a child rider. I also included the annual cost. This would be added to your policy’s term life insurance cost. This is one of the best benefits of a child rider: one rider covers all of your children. When you purchase your life insurance policy, the child rider will provide the coverage amount to each of your current children under 18 years of age and any future children you have or adopt. Jane Smith, 45, has five children ages six, eight, 11, 15, and 20. She purchases a 20-year $500,000 term life insurance policy for an annual price of $480. She decides to add a $10,000 child rider that costs $50 per year. This moves her total annual life insurance premium to $530. This rider will cover all of her children with $10,000 in coverage each except for the 20-year-old since he is not a minor. When you add on a child rider, you’re also locking in your child’s future insurability. What this means is that you, or your adult child if ownership is transferred, can convert the child rider into a standalone whole life insurance policy without having go through underwriting. Normally when you buy life insurance, you take a medical exam and your personal records—such as health records and driving records—are reviewed. However, converting a child rider into a new policy does not require these steps. This is especially beneficial if your child developed any sort of health issue or maybe found him or herself in a bit of legal trouble. John Smith, 35, purchased a 30-year term life insurance policy on himself and added a child rider to provide his son, Thomas, 5, with coverage as well. The child rider allows conversion until Thomas’ 25th birthday. When Thomas is 12 years old, he is diagnosed with type 1 diabetes. When it comes to buying life insurance with a type 1 diabetes diagnosis, being table rated is common. This means that the insurance companies require a higher premium amount to account for the risk—the standard price plus a certain percentage. However, with a child rider, Thomas’ diabetes diagnosis would not come into play if he decided to convert the rider into a permanent policy. He would receive standard pricing. The rider’s conversion period is often when your child is between the ages of 18 and 25. Converting a rider into a permanent policy when your child is young is beneficial because a cash value can start accumulating early on. The cash value inside the policy grows tax-deferred and death claims will be paid out tax-free in most cases. The sooner a permanent policy is purchased, the sooner the cash value can start accumulating. Like with most invested monies, the longer it sits, the more it generates. A permanent policy purchased as a young adult can grow to a substantial amount. However, if your child grows into a healthy adult, he or she may wish to consider purchasing their own term life insurance policy instead of, or in addition to, converting the rider into a permanent life insurance policy. The premiums of a permanent life insurance policy are much higher than term life insurance costs. Child riders are often quite standard with the same relative features. Most of the insurance companies Quotacy works with offer a child rider on their term policies. However, only one of these companies does not require a medical questionnaire. If you have a child with a disability, special needs, or has been diagnosed with a serious medical condition, then you may want to consider Principal Financial. Principal does not require that you fill out a medical questionnaire about your children when buying a child rider. Most insurance companies’ child riders provide rider coverage for your children who are between the ages of 15 days and 18 years. A few companies extend this age up to 20 or 23 years old, but these adult children are required to be unmarried and financially dependent on you, the insured, at time of policy issue. Some insurance companies will not offer rider coverage to children with special needs or other serious health conditions. If one of your children has a health issue that could result in denial of coverage, when you run quotes on Quotacy, choose Principal Financial when applying. Most insurance companies’ child riders provide coverage on your children until their 25th birthday. After age 25, the coverage provided by the rider expires unless you or your adult child convert the rider to a permanent policy. Riders have different conversion expiration periods. Most require that the rider is converted by the child’s 25th birthday, but this age can vary among the companies. Most insurance companies’ child riders provide coverage amounts of $10,000 per child, but options can range from $1,000 to $100,000 depending on the company. The amount of permanent life insurance you can convert the rider also into varies by company. Certain companies allow you to convert to a policy up to five times the amount of the rider. For example, if you buy a $10,000 child rider, it can be converted into a whole life policy with a face amount of $50,000. A child rider is inexpensive and it simply just gets added onto your overall term life insurance cost, if you choose to purchase one. Once it expires, that amount drops from your term life insurance cost. The annual amount is usually a nominal $50, but this can vary slightly depending on the insurance company. Refer to the previous table above. We have a review page for each of the life insurance companies we work with. On these pages, we provide details about the policies, including the riders available and their features. If there are particular features you are looking for in a term policy, review these pages to find a company best suited for your insurance needs. If you would like a more personal touch, you can instead contact Quotacy via live chat, email, or a phone call to discuss your needs. 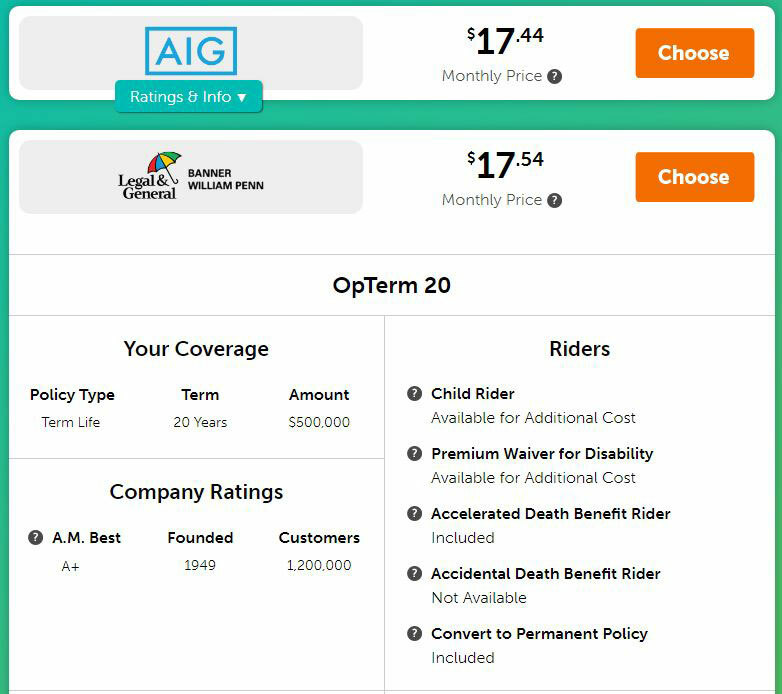 When you run term life insurance quotes on Quotacy, when you’re shown your quote options we also provide a summary of each company’s features. These features include whether or not a child rider is available. When you apply for a term life insurance policy through Quotacy, you’ll be asked on the application form if you have children and if you would like to add a child rider. Your agent will let you know how it will affect your term life insurance cost. Term life insurance is affordable and can fit into most families’ budgets. Adding a child rider is a nominal fee, but has many benefits. Start the process by getting a term life insurance quote instantly. No contact information required to see quotes.